Mostly distracted by the misteaching of the early christian church (whose man made doctrines time and time again contradicted with science) the west moved away from acknowleding God’s beauty of creation by the study of science. But inherently it is that curiosity that is ever present in human mind, the curiosity and that deep inspiration to know about our universe, our world and the cosmos. Nasa’s latest mission, Deep Impact is one such endaevor on behalf of human race to know the origin of our solar system, our own universe. 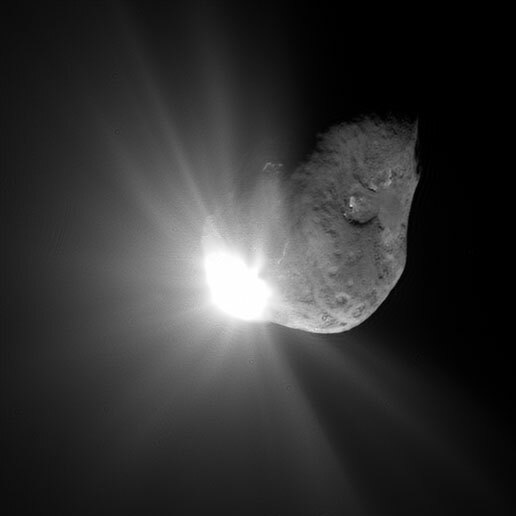 This spectacular image of comet Tempel 1 was taken 67 seconds after it obliterated Deep Impact's impactor spacecraft. The image was taken by the high-resolution camera on the mission's flyby craft. Scattered light from the collision saturated the camera's detector, creating the bright splash seen here. Linear spokes of light radiate away from the impact site, while reflected sunlight illuminates most of the comet surface. The collision occurred at the relative speed of 37,000km/h, with the mothership standing off at a safe distance of several hundred km to view the impact. The crash unleashed a spray of below-surface material that has probably remained unchanged since the formation of the Solar System 4.6 billion years ago. Researchers hope that by getting "under the skin" of Comet Tempel 1, it will give them a new insight into some of the Solar System's original materials. The accuracy required was so great that one mission scientist said it was like one bullet hitting another bullet with a third bullet exactly in position to see it all happen! Unlimited congratulations to human race ! !